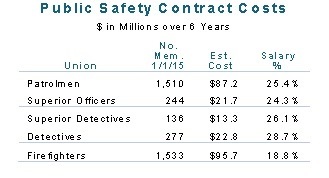 As the City of Boston and its 40 employee unions are preparing for the next round of collective bargaining negotiations to begin in early 2016, the officers in the Boston Police Detectives Benevolent Society union received an arbitration award on December 22, 2015 that would provide a salary increase of 28.7% at an estimated cost of $22.8M over six years (July 1, 2010 – June 30, 2016). This arbitration award is based on components of the highly expensive 2013 arbitration award for the police patrolmen and continues an escalating cycle of awards that is fiscally unsustainable by the City and could lead to service reductions in other areas. No provisions for management improvements were included in this award. This award, coming just before the start of negotiations for new contracts, will influence demands by the four uniformed police unions, and the firefighters union whose contract will expire a year later in 2017. By contrast, the City’s civilian unions, including the teachers, agreed to salary increases of approximately 12.6% over the six years and now will expect higher salary increases in their next contracts. The 2013 arbitration award for the Boston Police Patrolmen’s Association (BPPA) attempted to create parity in compensation with the firefighters, resulting in a very expensive contract estimated to cost $87.2M over the six years. The components of that award became the model for the Detectives’ award in 2015, which will now be the model for the next round of negotiations in 2016. After Mayor Walsh assumed office in 2014, he was able to settle contracts with the police Superior Officers (4/4/14) and Superior Detectives (4/4/14) unions. The City was not able to deviate in any real way from the BPPA percentage increase since these two unions could also seek binding arbitration. The Mayor also negotiated the contract with the firefighters (IAF, Local 718) (4/11/14). The City’s offer to the Detectives was in line with the other three police unions, but the Detectives sought a significantly higher compensation increase. The Mayor would not agree to a contract providing larger raises than received by the other police unions, and the Detectives’ union sought arbitration. The funding of this award must be approved by the City Council to become effective. Rejecting the award would require the parties to return to the bargaining table. The City could fund this award, but the cost to other city services could be substantial over time. The growing costs for salaries, employee benefits, and state assessments and relatively flat state aid will squeeze funding for other basic city services. The long-term financial impact is what the City Council will need to consider carefully as it evaluates the funding for this award.